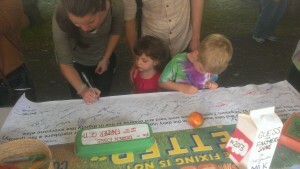 Since 1985, Farm Aid’s Annual Concert has celebrated family farmers and drawn attention to the crises they face. 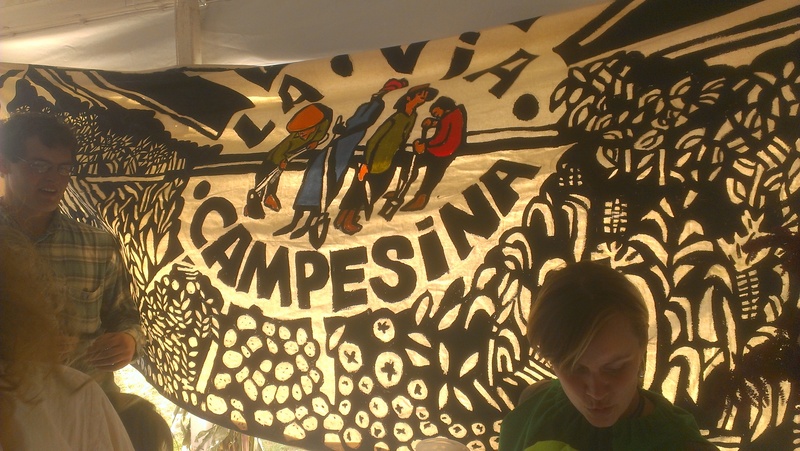 This years concert, held in Saratoga Springs, NY, attracted approximately 25,000 people to attend farm tours, walk through the educational Homegrown Village, and hear Willie Nelson, John Mellencamp, Neil Young, Dave Matthews and many others perform. During his surprise appearance in the concert, Pete Seeger sang “This Land is Your Land” with an extra verse about New York that ended with the line “New York was made to be frack free.” You maywatch the video here as well as other videos on Farm Aid’s YouTube channel. Below are some photos of NFFC’s booth in the Village. Our theme this year was “Farming in the Red,”much inspired by Coalition member Northwest Atlantic Marine Alliance, who portrayed “Fishing in the Red” at an adjoining table. Robin Fitch, Gretchen Maine, Ben Burkett, Joel Greeno, Ralph Paige, Tywan Arrington, Susan Youmans, Savi Horne, and Nancy Romer staffed our table with Kathy Ozer and Lisa Griffith, asking passersby to read about farmer pricing issues and sign an enlarged version of the Land O’ Fakes postcard supplied by Family Farm Defenders. NFFC policy assistant Rachel Nagin had made displays of eggs, potatoes, lettuce, cheese, bacon, ham, cereal, carrots, and milk comparing the 2000 and 2013 retail prices and farmer share for each item using USDA NASS Agricultural Prices, with all amounts expressed in 2013 dollars. 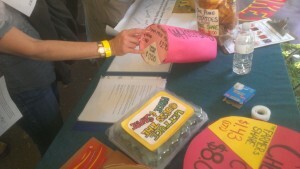 Lisa had created a binder with Coalition member asks for helping family farmers achieve a fair price. 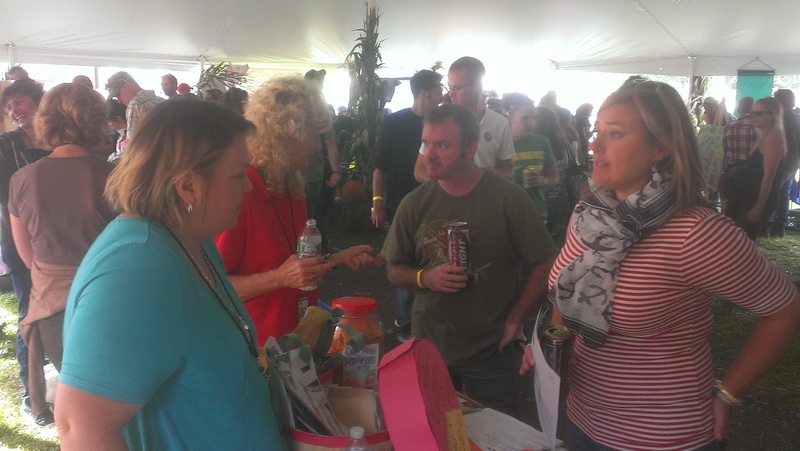 The Associated Press ran an article about Farm Aid which was picked up by many news sources, including the Washington Post. 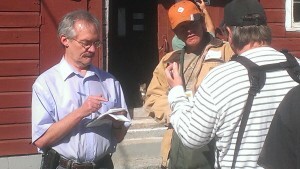 Joel Greeno was interviewed and quoted in this front page article from Schenectady, NY’s Daily Gazette. 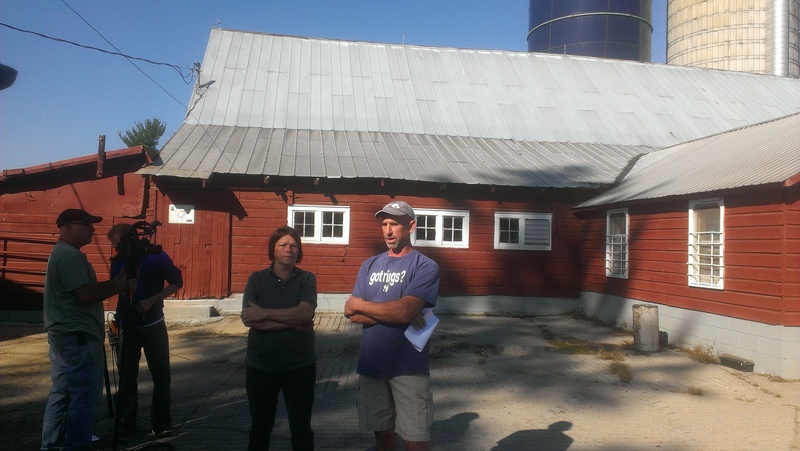 Roger Allison, executive director of Misouri Rural Crisis Center and family farmer, was widely quoted including in this ABC article. Willie Nelson wrote an op-ed for the Huffington Post. 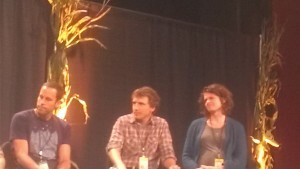 Other NFFC organizations, including Rural Vermont, National Young Farmers Coalition, RAFI, and Farmer-Veteran Coalition, a project of member Farms Not Arms, also exhibited in the Homegrown Village. 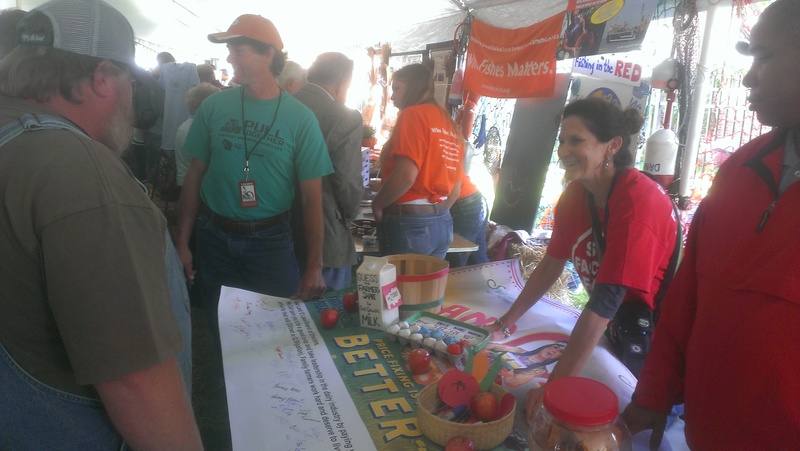 Ben and Lindsey Shute of NYFC were on the media stage prior to the concert and Patchwork Family Farms (Missouri Rural Crisis Center) served their famous ham, brat, and chop sandwiches. 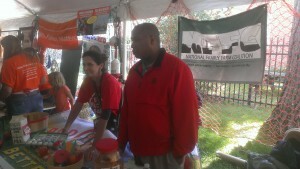 Joel, Lisa, and Tywan the the NFFC Booth. Lisa and Tywan at the NFFC Booth. 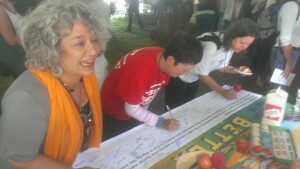 Homegrown Village attendees signing Land o’Fakes postcard. Gretchen Maine and Robin Fitch speaking with Homegrown Village attendees. 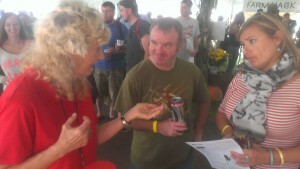 Gretchen Maine speaking with Homegrown Village Attendees. 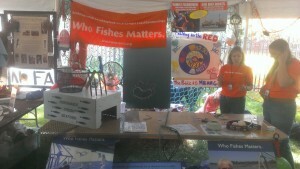 NAMA’s “Fishing in the Red” Booth. Farm Tour at Willow Grove Dairy Farm on September 20th. At the Farm Tour at Willow Grove Dairy Farm on September 20th, the Daily Gazette from Schenectady NY interviewed Joel Greeno. At the Farm Aid Press Conference on September 21st. L to R: John Mellencamp, Willie Nelson, and Carolyn Mugar (Founding Executive Director of Farm Aid). 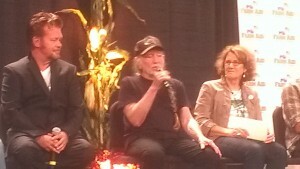 At the Farm Aid Press Conference on September 21st. L to R: Jack Johnson and National Young Farmers Coalition’s Ben and Lindsay Shute. 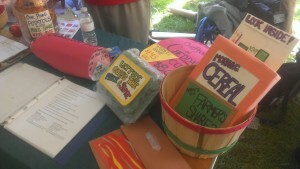 This entry was posted in Blog and tagged Farm Aid. Bookmark the permalink. Pingback: Below market price. Website for sale.